For over a dozen novels and a goodly number of short stories and novellas, Jim Butcher’s Dresden Files have delighted millions of readers around the world. It’s fair to say that Harry Dresden may be the most famous supernatural detective in modern fiction. A fully ordained Wizard of The White Council, Dresden is also an accredited private investigator and the Chicago Police Department’s go-to guy for any supernatural weirdness that the cops can’t explain away as business-as-usual. The series is full of comic book references, such as Harry’s car, an oft-destroyed and oft-rebuilt Volkswagen Beetle, being named after the superhero “The Blue Beetle.” As a character, Dresden himself seems to be a mix of Marvel Comics influences – think “What If Peter Parker Had Become The Sorcerer Supreme Instead Of Doctor Strange?” It’s no surprise, then, that Jim Butcher recalls his love of comics as a kid and their influence on his writing in the introduction to this volume, the first original graphic novel starring Harry Dresden. The plot centers upon a murder at the Lincoln Park Zoo. Harry is brought in to investigate the death of a night watchman who was beaten to death by something much stronger than he was. The best theory the police have is that one of the gorillas somehow escaped its locked enclosure and turned savage. It’s a flimsy theory, but it’s enough to make the city demand the accused gorilla be put to death, despite the protest of the zoo’s primate experts that gorillas are docile and attack only if threatened. In order to save Moe the Gorilla’s life – to say nothing of the lives of any future victims – Harry must put all his skills as a detective and a wizard to the test. This story is set in the early days of Dresden’s career, so comic readers unfamiliar with the novels don’t need to worry about references to the books that they won’t understand. Indeed, Butcher does a masterful job of introducing all the established players besides Harry himself. These include Lieutenant Karrin Murphy (Harry’s main contact with the Chicago PD), her skeptical partner Carmichael, and Bob The Skull – a spirit of knowledge bound in a human skull who acts as Harry’s research assistant and comedic foil. On the other side of the fence, fans of the Dresden Files who aren’t regular comic readers will be glad to know this graphic novel reads just like one of Butcher’s regular novels, despite the inclusion of some pretty pictures. The pretty pictures are provided by the always excellent Ardian Syaf. Syaf’s character designs perfectly capture the look and spirit of each of the established characters. Harry is a tall, lanky man who resembles an unshaven Peter Parker. Karrin Murphy is a short but powerful-looking woman with hard eyes that don’t seem to fit the rest of her pretty face. And Bob – well, he looks like a skull with glowing orange eyes. More importantly, Syaf is an excellent visual storyteller who can match Butcher’s scripts for tone and pacing. The action scenes are laid out well and flow naturally from panel to panel. 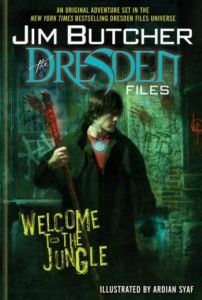 If this is your first exposure to the world of the Dresden Files, you are in for a treat. If you’re a long-time Jim Butcher fan who has never read a comic before, I think you’ll see the appeal of the medium by story’s end. And it should be obvious to all why this story was nominated for a Hugo Award and why it made the ALA’s Great Graphic Novels For Teens list in 2010. This novel is wholly appropriate for teenage audiences, containing nothing worse than a few curse words and some mild violence. Despite this, I would still recommend librarians place this series in their adult fiction collections (assuming you don’t have a separate adult graphic novels section), where it may be more easily discovered by Dresden Files fans who don’t usually read comics.